Meet our Senior Software Engineer, Dennis Yu. He studied computing at The Open University of Hong Kong and earned a degree in Bachelor of Computing after discovering a passion for the computational arts and sciences. 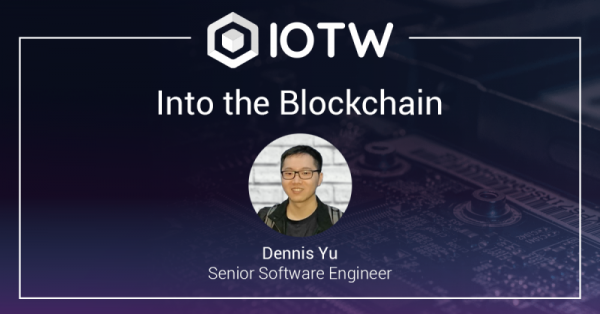 After years of developing software and programming for various software companies and organizations, Dennis joined IOTW last June to build upon IOTW’s existing application and web platforms. Right now, he’s coding the framework for the IOTW miner dashboard and as of late, he’s helped IOTW launch its testnet. Besides blockchain and fintech projects, Dennis has previously worked at Uni-China Group Holdings Limited on developing a mobile application for internal staffs at eateries and restaurants for organizing orders and prioritizing catering duties. This is uber useful for maintaining efficiency and optimizing limited labor force, which essentially, demands almost every workforce in every industry. At Advanced Integration Systems Ltd., Dennis expanded the software’s e-commerce applications and implemented a custom promotions module for SAP Hybris for managing business-to-business and business-to-consumer sales to provide solutions to both common and more complicated e-commerce businesses’ problems. Thru deep exploration and analyses of the databases and systems upon which the e-commerce applications collect data in order to arrive at conclusions for applications, Dennis received a taste of both the data collection end and the solutions development end of software. Dennis developed such softwares’ backend systems with java code, collected sales data and purchasing data then implemented these reporting systems into dashboards displaying daily sales reports and monthly P&L reports. Sales and P&L reports, crucial for establishing overall goals of a business, should always be transparent to employees and understandable. Throughout his years programming and developing different types of software, Dennis has acquired a knack for creating apps that are understandable and intuitive. As a result, Dennis joined our team with the hopes and intentions of creating applications that can be easily consumed by everyday people. IOTW is for the everyday person wanting to participate in blockchain applications, and most directly, in the home. Specializing in producing and launching mobile apps, relational database development and building web functionalities with Java and Nodejs, Project IOTW culminates his experiential knowledge into an application that calls users to action. Just as the Uber app calls to action persons looking for rides and delivers a product with real results (i.e. a car ride) thru virtual assistance (i.e. the mobile application), IOTW calls consumers interested in otherly currencies to test micro-mining and its capabilities that can change a user’s consumption and lifestyle. For example, a user who garners ten IOTW coins can use the coins to purchase an Internet of Things light bulb that is also capable of micro-mining for crypto. This light bulb, thus, changes that way the user lives and uses electricity; electricity is then not only used for powering the IoT device, but it is also used for mining coins that are used in a virtual marketplace. A running theme amongst these projects that Dennis have created is: logistics optimization. Dennis participates in IOTW blockchain development to provide micro-mining enabled IoT devices to all sorts of audiences. The Android and iOS mobile wallets also employ web-based IOTW miner dashboards–similar to those daily sales reports and monthly P&L reports he created for other industries–that track how much has been mined and used. What’s this all for? Optimization of resources, backed by HTTP web services that constantly feed connected IoT devices new information to facilitate optimization.